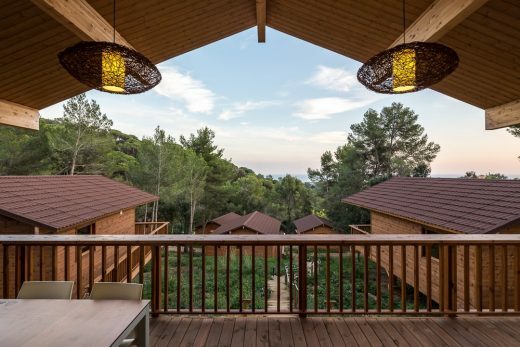 Camping Cala Llevadó is one of the most emblematic campsites in Costa Brava. 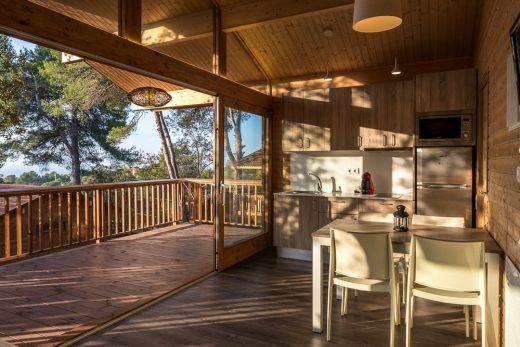 It is situated next to the beaches between Tossa de Mar and Lloret de Mar. The campsite as a client requested us a proposal to put 33 units in a part of virgin forest situated at the tallest part of the camping. 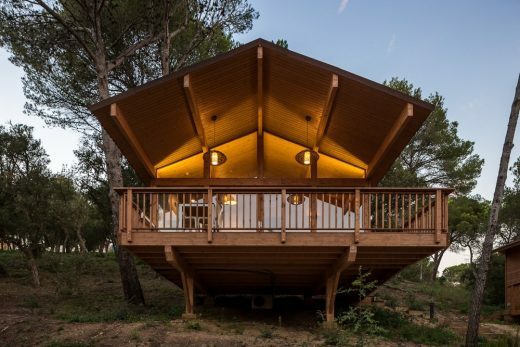 The campsite is located at the side of the natural park called “Massís de Cadiretes”. This natural park is formed by mountains of oak, cork and pine trees that are arriving to the sea. The area of intervention is exactly with the same characteristics. Following sustainability concepts, that the same camping has been following for long time, we decided that it would be necessary to make a proposal affecting as less as possible the existing forest. So we propose to touch as minimum as possible the terrain, without modifying its topography, and of course without cutting any existing tree. So the idea was also that as a client you could feel IN the forest itself and with the maximum services possible. 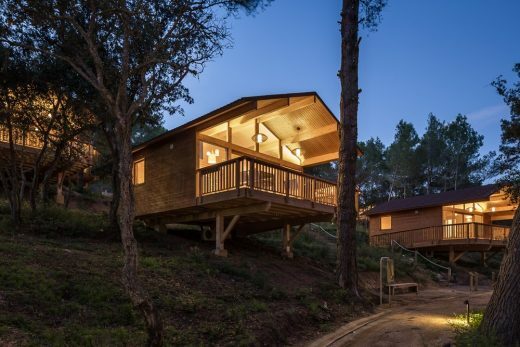 We wanted to bring the future clients a different offer for this kind of tourist accommodation (minimum environmental impact and maximal energy efficiency). In order to achieve these goals, we proposed to make a round walkway to give access to all the wooden houses. We proposed to concentrate all the installation services (pipe water supplies, drain water, fire water supply, electricity, lighting, fiber optic) under this path, so we could reduce as much as possible the holes on the field. This pathway is also following the topographic lines, so it make the wooden houses also very accessible. 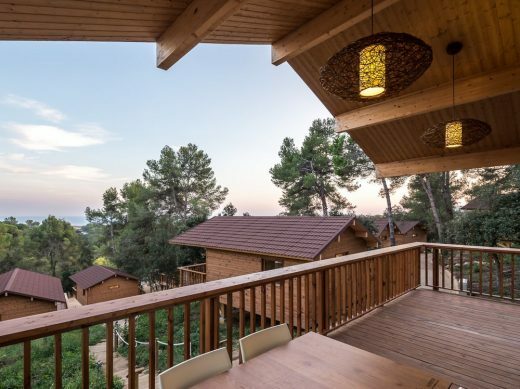 At the same time we situated the wooden houses without touching the existing trees and alternating spaces between them, that is giving more view to the forest and the sea, and also provides more privacy to each house. In the other hand, the wooden houses should have the following characteristics: – Made out of natural wood. Must be 100% demountable and recyclable. 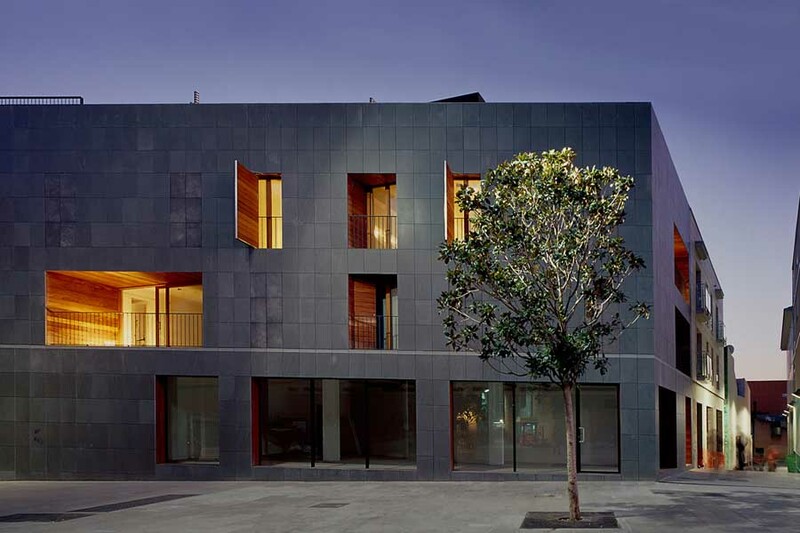 – We proposed thermal ecologic isolation made out of black cork boards. The natural park that is next to the camping is providing the cork raw material, so we considered very important to close the circle between provider and final user. We used this material as thermal isolation all around the houses (roof, floor and walls). This material has unique characteristics like hygrothermic regulation, rotproof, compression resistance, etc. The industrial process is 100% ecological. 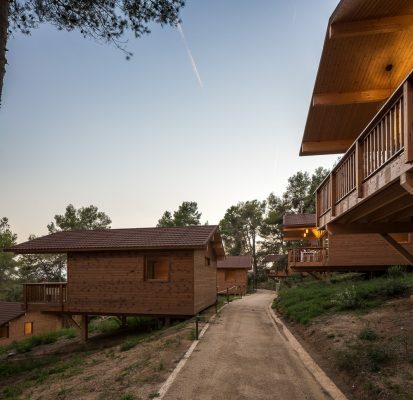 – The wooden houses must stand just over 4 wooden columns over small concrete basements. 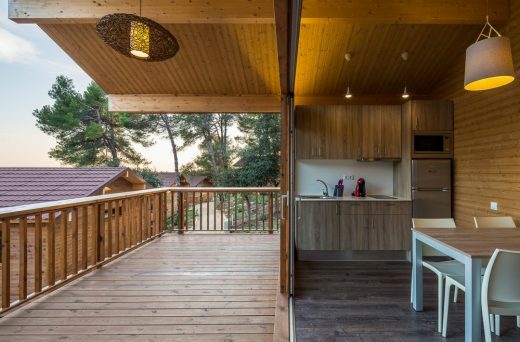 – In order to enhance this sensation of living IN the forest, we propose the south façade all in glass with corridor doors, and protected by a great cantilever connecting a big terrace outside with the living space inside. 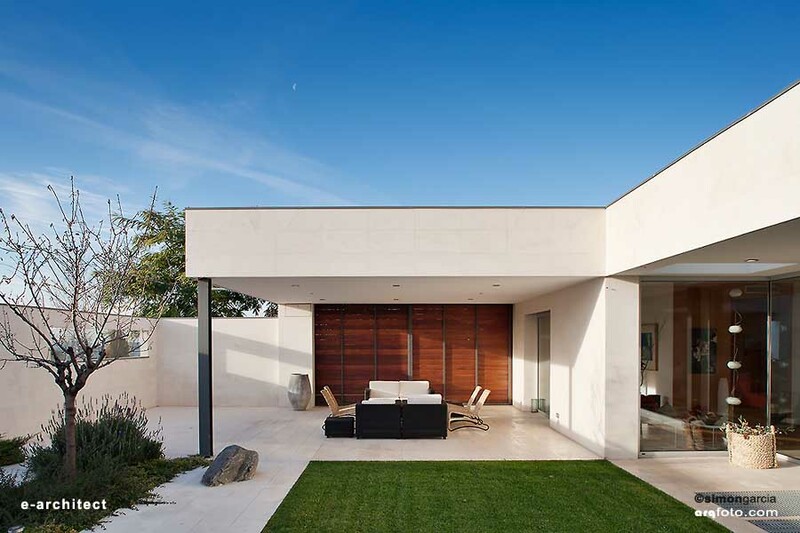 – This cantilever at the south orientation protects from the summer sun, but allow th sun to come inside in Winter time. This way it is also possible to generate a crossing ventilation with the sea breeze, that is the most efficient natural refrigerating system for this climate area of Costa Brava. 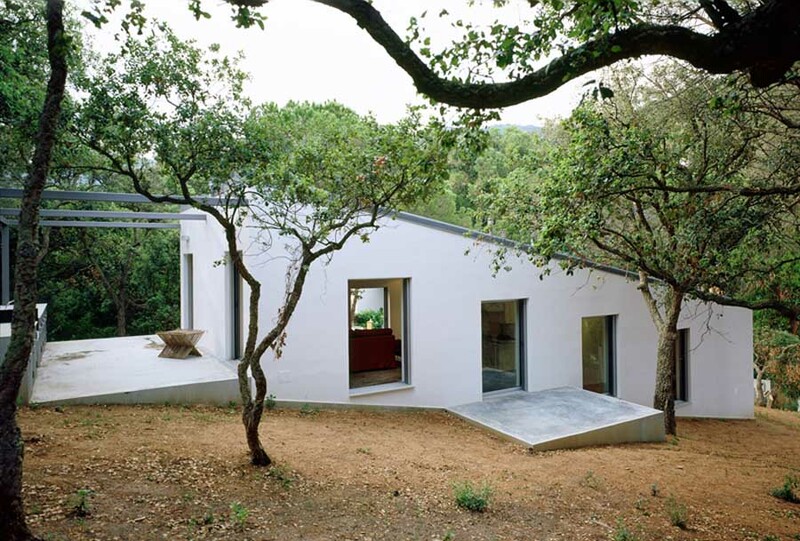 – The access to the wooden houses must be allways by behind to generate privacity of the front part. – Lightning was proposed with low efficiency light and led light. – Another energy saving solutions proposed were an automatic energy switch off, lower the volume of water consumption, etc. – Each kind of house is different depending on the program, so the smaller house is for 2 persons in one space, the standard one is for four persons with two bedrooms and the biggest one is for six persons with three bedrooms. The urbanization proposed should be coherent with the Project, so the criteria used are the following: – Floor pavement of the walkway made out of compact sand of the same land – Use of wooden beams for the stairs and kerbs of the walkways. 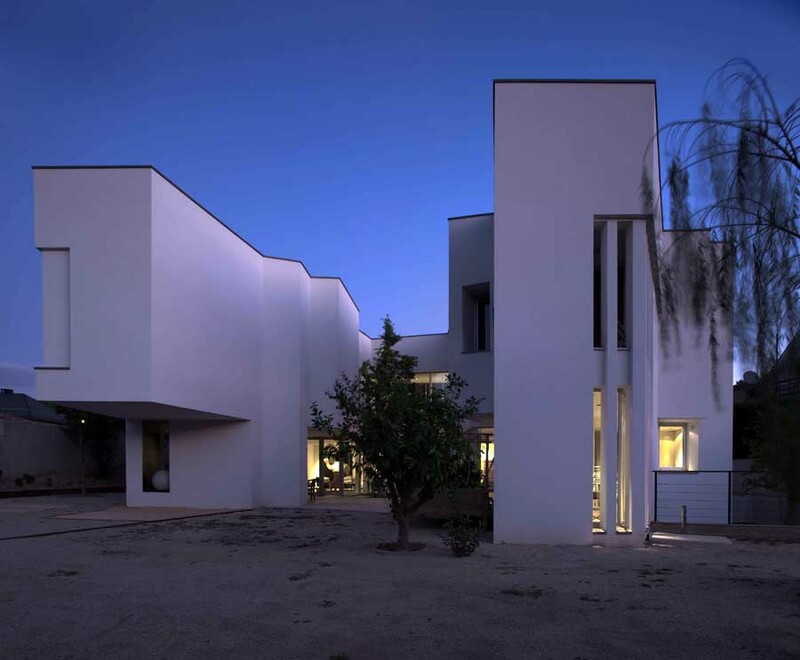 – Lighting of the pathways and stairs has been proposed with marker indirect lights – Natural gardening with bushes and trees of the meditarrean clima. 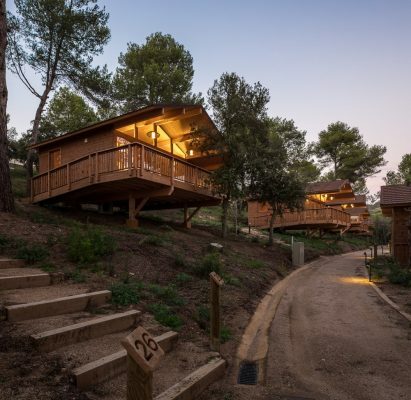 Situation: Camping Cala Llevadó. Tossa de Mar.